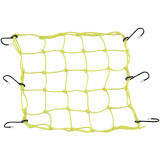 Rich - MA Yellow net "Great net and the yellow i was looking for .... local moto stores did not carry yellow color. Would purchase again!" CHELSIE - SEATTLE, WA VERY GOOD NETS "WE LOVE THESE NETS AND USE THEM ON OUR TERXY 800. WORKS GREAT IN THE TIGHT TRAILS AND KEEPS THE BRUSH/TREE BRANCHES AND BLACKBERRY BUSHES OFF OF US AND THE KIDS IN THE BACK SEAT."